From its beginning, Iwa has been seeking ways to enable the gospel message to go beyond the doorstep of the minds of people of Japanese and Asian ancestry and penetrate deeply into their hearts by discovering the cultural touching points of the gospel. Another way to describe what Iwa has been doing is to say that Iwa has been “contextualizing” the gospel for Japanese and Asian cultures. Often, people who contextualize for a particular culture do it subjectively by looking inward at their own cultural sensibilities and identifying what feels right to them. Iwa has relied on a more objective process of reflecting on Scripture, praying for insight to see the Scripture through different cultural eyes, sharing new insights through writings and speaking opportunities to test whether or not they resonate with the people they were meant to touch, and then creating and testing resources based on what has been confirmed and affirmed by the people. It was Iwa’s purpose from the start, to blaze a path that could be followed by others who could contextualize the gospel for every other culture in the world. It is still Iwa’s vision and hope for that to take place, and for the entire world to be reached for Christ as a result. All of Iwa’s resources have come out of this process of contextualization. But featured here are those that have more to do specifically with culture and contextualization. Learn about the reasons behind what makes Iwa's resources different here. This resource will be available for order in the online store. It has been Iwa’s contention that God has a unique and strategic role for minorities, bicultural people, and immigrants in God’s plan for world redemption, both as cultural bridges and cross-cultural interpreters for the God who transcends culture. To give biblical support to that belief, this message presents how God uses bicultural people like Moses and Paul as cultural bridges to accomplish His mission in the world. If Japanese and other Asian people tend to be group-oriented while people from Western cultures tend to be individual-oriented, what implications are there for evangelism to people of Japanese and Asian ancestry? This monograph explores how evangelism to group-oriented people may look different from the evangelism usually seen in the U.S. and other Western societies. How can Christ be introduced to people of Japanese ancestry in an effective, interpersonal, culturally sensitive way? This monograph presents the Japanese concept of “on” (pronounced like the word, “own”)—roughly translated, “obligation” or “indebtedness”—as a key to understanding how to engage in the kind of evangelism that fits the culture of people of Japanese ancestry. Should God’s discipline be seen only as punishment, or is there a different way it can be viewed, a way that makes more sense to people for whom even disapproving silence can be enough to set them on the right path? This monograph presents a cultural reinterpretation of the advisement from Proverbs 3:11 that the discipline of the Lord should not be regarded lightly, based on such Japanese cultural considerations as childhood experiences of being raised in a Japanese American family and the concept of shikataganai. 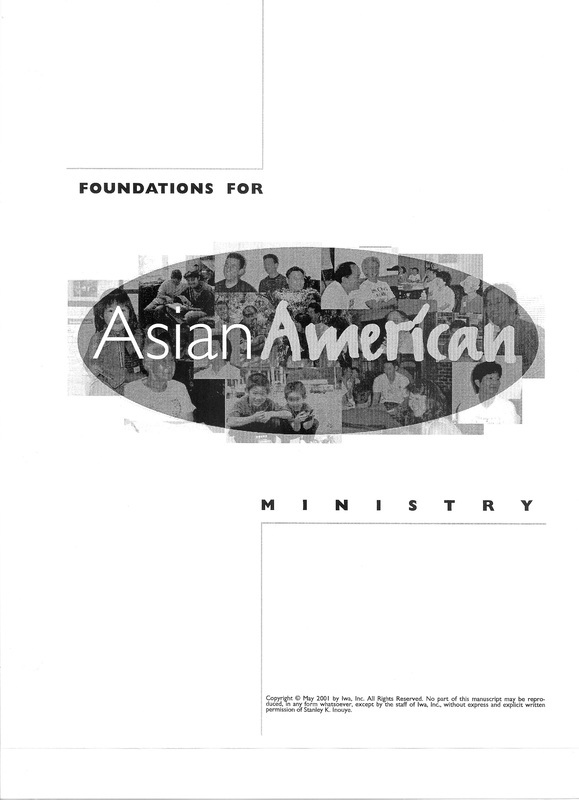 This booklet provides a review of the Willow Creek Association’s popular evangelism training program, the Contagious Christian Course, with suggestions on how to maximize its effectiveness for Asian Americans and other Asian people. It is not only valuable as an assessment of a particular evangelism training program, but is also valuable as an exposition of Iwa’s philosophy of evangelism. In this structured learning experience, participants explore the characteristics of two hypothetical cultures and then imagine what would happen if representatives from those cultures meet to discuss a merger of their companies. This study presents what takes place when a person is strongly influenced by two different value systems, and what implications emerge for ministry as a result. 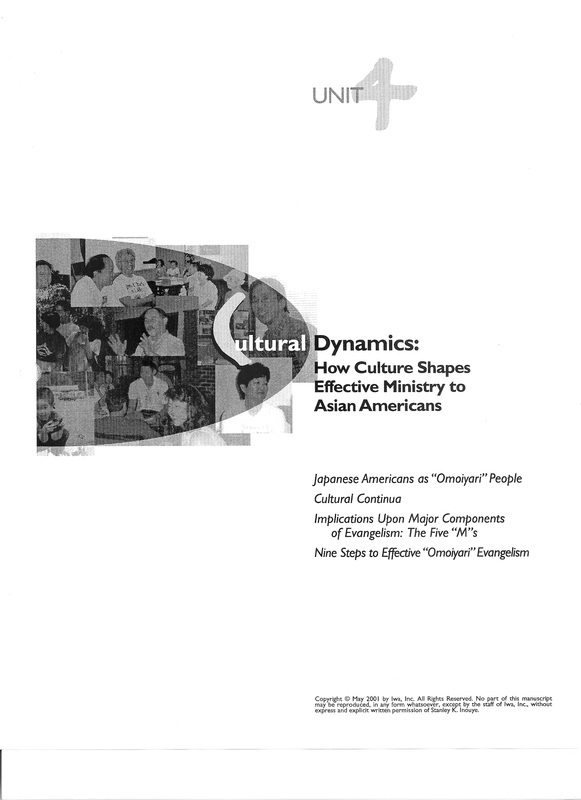 How can Asian American churches identify and select their leaders in a biblically based and culturally sensitive way? This resource presents a practical step-by-step process that brings together Scripture and culture to offer an alternative to unexamined traditional ways of selecting leaders that are often popularity contests or mere position-filling tasks. One unique feature of this resource is a clear presentation of the characteristics of a leader who has cultural competency to work in an Asian American context. Another is the offering of a form with a convenient checklist for evaluating the fitness of a potential leader to serve in a given ministry position.